Results of the first market research comparing Russian millennials (Generation Y; aged 18-35) and centennials (Generation Z; aged 14-17) reveal differences and commonalities between two young generations that are already wielding significant economic power and influence around the globe. Following this trend, the Young & Younger research polled 1,500 young people throughout the Russian Federation, measuring their habits and attitudes towards specific brands and communications channels. The research was commissioned by PBN Hill+Knowlton Strategies, an international strategic communications agency, and carried out in partnership with MAGRAM MR, an independent research agency. The results were released in May to several hundred marketing and public relations executives gathered in Moscow. YouTube is now the main platform used by Generation Z to search for and consume content across virtually all product categories, the research findings show. While Generation Y continues to look for information about health & sport, technology and business through search engines, Generation Z has switched to YouTube. Notably, centennials even follow the news through YouTube (46%). Millennials are also not far behind, with 40% of respondents saying they prefer to get their news from YouTube, where they also watch entertainment content (49%) and videos about technology (45%). As a result, most of Generation Z’s stars and influencers in Russia have also come from YouTube – they include beauty and fashion vloggers Maria Way and Ira Blanc, along with entertainer Kate Clapp. When it comes to music, Yury Khovansky and a number of Russian rappers dominate, while for entertainment, centennials look to Max +100500 and Danila Poperechny. Meanwhile, Generation Y likes to keep track of various media personalities (TV presenters, actors and singers). TV hosts Olga Buzova and Ksenia Borodina and actress/presenter Nastasya Samburskaya are particularly popular. For comedy, millennials look to Pavel Volya and Garik Kharlamov. For music, they prefer rock, listening to popular female singer Zemfira and the band Leningrad. Both generations are fans of Nikolay Sobolev, who highlights and exposes pressing social issues in his video blog on YouTube. The only TV stars popular with both generations are presenter Olga Buzova and the hosts of global travel program Oryol i Reshka (Heads and Tails), Regina Todorenko and Andrey Bednyakov. Both generations mainly communicate through social media (75%), where they spend several hours a day (74%). Generation Y is more inclined to share and post than Generation Z (37% vs. 20%), but Z listens to more music and plays more games. Millennials use many more devices to get online than centennials with laptops being their preferred tool (59% vs. 41%). Smartphone access to the internet, however, dominates for both generations. The top social network for young Russians is still Vkontakte (99% of respondents use it and 90% say it is their main account), followed by Instagram (67% for Generation Y and 61% for Z). Aside from YouTube, both generations like to get their news from social media (83%) and sites online (75%), while print media is losing its popularity (18%). Messenger services, such as Telegram channels, are yet to carve out a significant niche with young people (12%). Both generations still watch TV everyday (41%), mainly viewing TV series (42%) and entertainment programs (54%). Generation Z notably considers TV as an important source of information on politics, the economy and business. MTS is the most popular mobile operator for young people (30% for Y and 31% for Z), trailed by the rest with comparable audiences (24% for Tele2; 21% for MegaFon; and 20% for Beeline). When it comes to smartphone brands, the top picks for both generations are Apple and Samsung, chosen by 22% of millennials and 24% of centennials. In third place is Sony, the manufacturer of choice for 8% of Generation Y respondents and 3% of Generation Z, followed by Nokia (6% of both). Chinese brands like ZTE, Huawei and Xiaomi follow. Interestingly, however, in a number of cases, Generation Z is keener to buy smartphones from China (for example, ZTE smartphones are used by 4% of centennials compared to just 1% of millennials). Another unexpected research finding is that 25% of Generation Z respondents don’t use any messenger services at all, while for Generation Y this figure is just 11%. Millennials are more deliberate about their purchases and plan in advance (37%), choosing trusted mass products and brands (24%). Centennials don’t plan their purchases in advance (44%) and opt for unique items and brands that others don’t have (40%). Asked what kind of purchase gives most pleasure, both Generations Y and Z said clothes (51% and 50%). In second place are shoes, followed by electronics (33% for Y and 31% for Z). For Y, cosmetics are another top pick (21% compared to 17% for Z), while Z is slightly more interested in sporting goods (15% vs. 11% for Y). The online survey was conducted in 15 Russian cities with a population of over 1 million people. The survey polled 1,500 young people in April – May 2017. Generation Y: aged 18 – 35. Generation Z: aged 14 – 17. Research was carried out by the independent research agency MAGRAM MR together with PBN Hill+Knowlton Strategies, an international strategic communications agency. 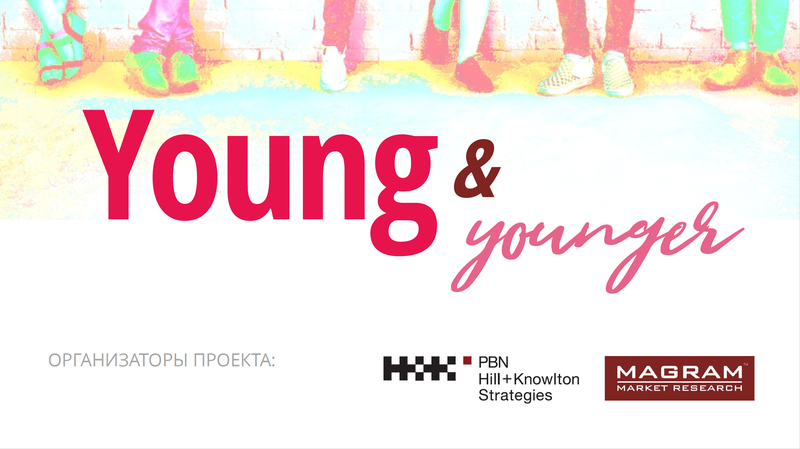 PBN Hill+Knowlton Strategies is the preeminent strategic communications firm specializing in Russia, Ukraine and Kazakhstan, and part of the Hill+Knowlton Strategies network of more than 80 offices around the world. The company was the first international PR agency to enter the Russian market in 1991. The company’s services include corporate, marketing and crisis communications, government and public affairs. The agency services clients across a broad range of sectors, including finance, FMCG, oil and gas, telecoms and technology, pharma and consumer electronics. MAGRAM Market Research is an independent marketing and social research agency. It is one of the largest players on the Russian research market. The agency offers a full range of quantitative and qualitative research services across consumer and business markets as well as specific target markets and custom-made research. For more information and to obtain a full copy of the findings, please email us at yandz@hkstrategies.com.